What was that? It was a strange gelatinous, translucent tube. April 19, 2017, a group of adventurers from Tucson, AZ took off to explore the oceans surrounding Bali and Komodo. This is Tobi's account from one of his dives in Bali. It happened on our recent trip to Indonesia. On the northeast coast of Bali, in the Tulamben area, we were up for some shore diving. The local volcano, Agung, had erupted in the 60's and left the region under a cover of black ash and lava. Therefore the sediment on the dive sites is mostly fine black powder and gives the place its unique character. We were finishing our first dive of the day and were drifting in shallow, crystal clear water in the mild current of the Bali Sea. The images and encounters of the dive were replaying in my mind; at depth we had seen several pygmy seahorses in a sea fan and I was hoping that some of my photos came out like I had imagined. Right beside it, I had found a fascinating Ornate Ghost pipefish, so camouflaged, it seemed like a miracle to spot one myself. While drifting and reminiscing like this, I suddenly spotted something big in the distance, toward the shore. Through the shimmering light rays of the shallow water, the object slowly formed shape, but my mind could not match it with anything that I had already seen or heard of. It was strange, around 10ft long and 8 inch wide, gelatinous, translucent tube with thousands of small egg-type objects in it. What was that? Possibly some kind invertebrate eggs, but what invertebrate could do that? 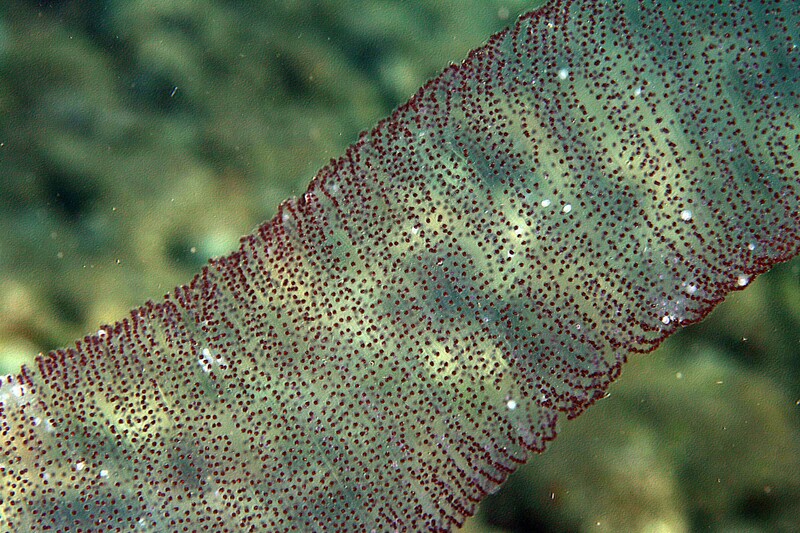 Maybe one of these mysterious creatures called salp that I had seen before in the Andaman Sea? No. No idea. I quickly took some "alibi" shots of the tube with my slow focusing 100mm lens. And off it went to drift again into the eternal blue. Later on the surface, nobody had any idea what it was and I quickly forgot about it. A few weeks later, my former marine biology professor, happened to pass by the store and suddenly I remembered my encounter with the mystery tube. Yes, if someone would know what it was, it was her! When I first showed her my blurry images she furrowed her brows. “I am not sure”, she said. I kept moving between the different images and zooming in and out. Suddenly her husband blasted out: “Those are squids!”. After zooming in on some of the more in focus eggs and a quick google search, we were finally all convinced that this weird tube was the egg coil of a Diamond or a Giant squid! What a surprise and one more creature to add to our long list of sightings of this beautiful dive trip.